Wow, these are really good. 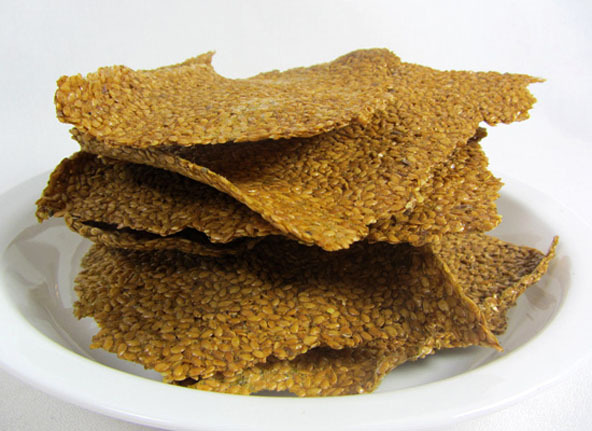 They are Gluten-Free, nutritious, keep really well and are actually quite easy to make. 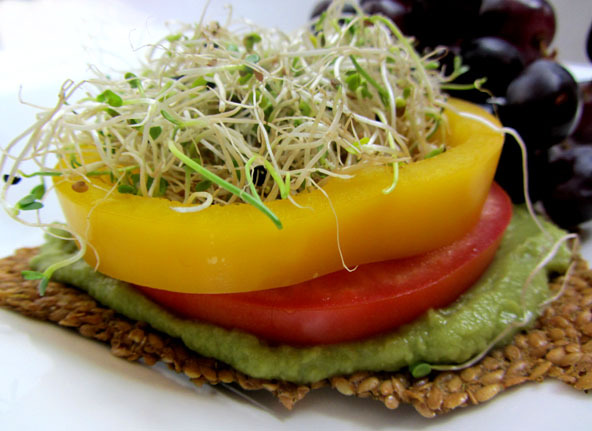 Top flax crackers with guacamole, tomato, bell pepper and sprouts for an fabulous snack. Makes 144 – 3″ x 3″ crackers. I recommend using the Excalibur Dehydrator. 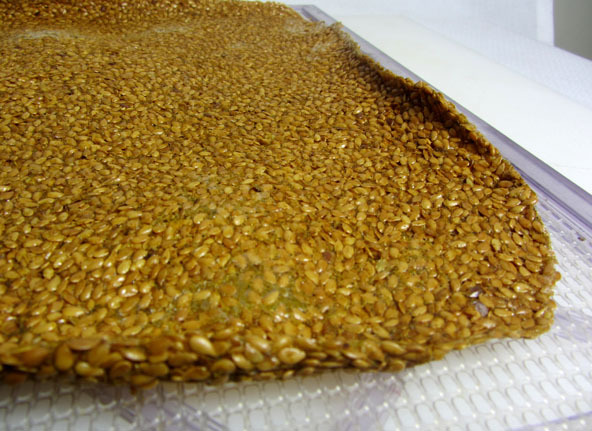 Two hours plus ahead of time, soak the 4 cups of flax seeds in 5 cups of water. 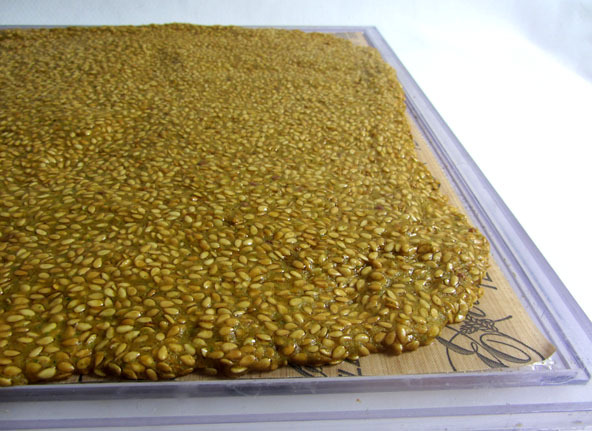 Once the flax seeds have been soaked for at least 2 hours, it will be gelatinous or like a thick gel. Start with the tomatoes in the bottom of the blender, add everything but the flax seeds. The blender will be full so pour ½ of the mixture into the large mixing bowl with the soaked flax seeds. Add ground flaxmeal while blender is running to the remaining mixture to keep the flax meal from creating any lumps. Pour remaining contents of the blender into bowl and mix together with a large spoon. Oil the teflex dehydrator sheets with olive oil and a paper towel. 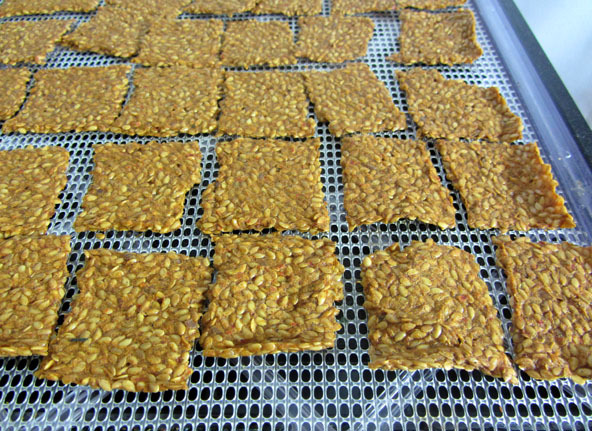 Spread batter mixture onto oiled dehydrator sheets. About ¼" thick for thin crackers and ½" thick for thicker crackers. 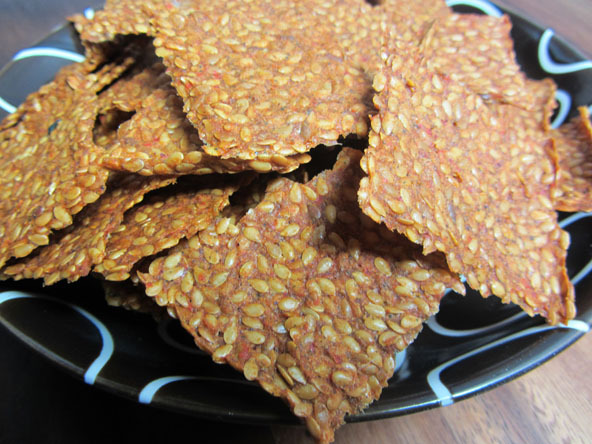 The thinner crackers dehydrate the quickest but will also break easily. It thins or shrinks up a bit in the drying process. If you spread it too thin to be a cracker, you can always put them in a baggie, seal it and pound on it to break them up into small pieces and use it as crunchies or a seasoning for things like salads or steamed veggies. To keep these raw with enzymes intact, dehydrate at 115 and check on it in 8 hours, when it looks dry enough, flip over onto the mesh screen and peel off the teflex dehydrator sheet. For even size crackers, you may want to score the crackers at this time. You can use a butter knife. Continue to dehydrate till crisp. Usually takes about 12-16 hours. If you're more concerned with time, than keeping them raw, dehydrate at the highest setting (mine is 155 degrees) At a higher temperature you can flip them over in about 4 hours and they should be finished in 8-10 hours or so. If you score the dough, this will keep the crackers from curling up. Curling isn't a bad thing except it makes it hard to get the crackers out from the dehydrator if your have the trays stacked close together like I do. So for this reason, I like to make sure I score them with a knife before placing them in the dehydrator. Here is what it looks like spread out and ready to go into the dehydrator. Un-scored and finished Veggie Flax Crackers. As you can see you can score them to any size or leave it in one big sheet and break into pieces. If you have extra dough, You may transfer it to a smaller container with a lid and store in the refrigerator until the dehydrator is free for another batch. I haven’t tried it but I think you could bake the remaining dough on an oiled glass baking dish for maybe about 1 hour at 200 degrees and flipping over at about 30 minutes. This is a BEAUTIFUL recipe!!! Well done!! I’ll make it today for sure!! !